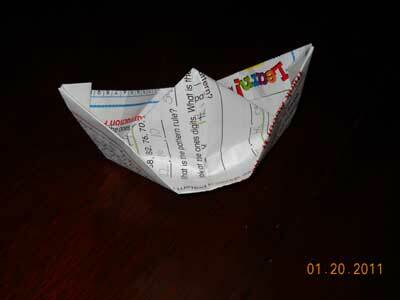 Here are origami boat photos that have been submitted by our readers. Check them out! 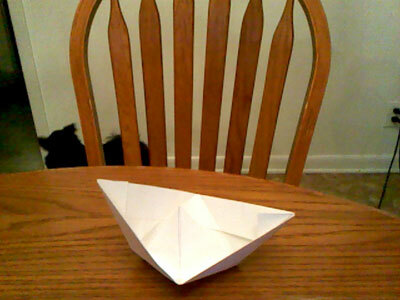 Thanks to our reader, Nick from Oklahoma for submitting his origami boat. " This is a boat i made. My sister was in my room and she saw th title and told me to make it. It turned out better than i thought it would." From Jack in Cheshire " I put a sail on it!" 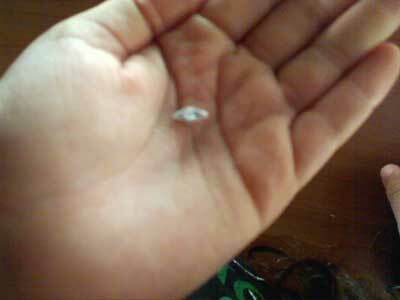 From Andrew in Peoria " This is the smallest origami boat that I have made. The penny is so you can see how small the boat is. I made this on a Sunday night using only my fingers to fold it. I hope you like it, and I don't think anyone can make a smaller one. " That is one small origami boat, Andrew. Anybody wants to challenge Andrew on this? 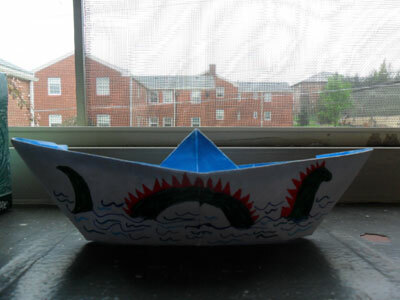 From Raina in Ohio " This is a boat that i made...I think its smaller than Andrews. :) Can his fit on a penny like mine? " Wow, Raina. 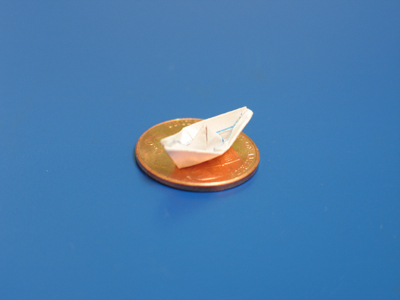 That is a very small origami boat! Based on the pictures, it seems yours is tinier than Andrew's! From Calvin, Griffin and Nicole in Fergus " These are our first annual origami boat racers! We had a blast building them! " 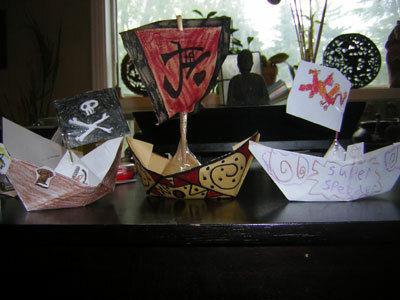 Love the decoration and pirate-looking origami boats!! 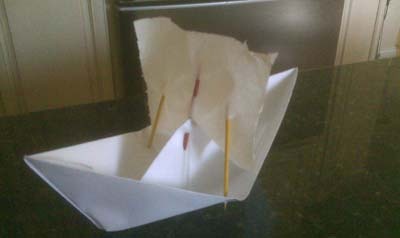 From Michael in Plano " This is my simple origami boat that I made. According to my ruler, it's about 1.5 cm. That's smaller than a dime, as you can see here. " 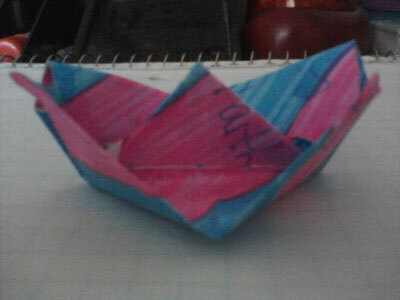 From Ephrainme in Lapu-Lapu City " Origami boats that I made... 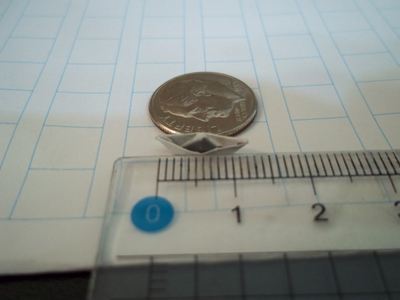 The smallest origami boat measures around 6mm. " From Orfeas in Ojai " This is an origami boat. It's length is exactly 1 cm long." 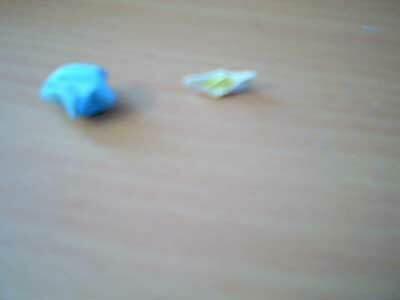 From Vanessa in Calgary " My origami boat its even smaller than an origami lucky star! I don't actually know if mine is smaller than Raina's or Andrew's.I'm very sorry that my picture was very blurry I tried everything i could to make it not blurry. " 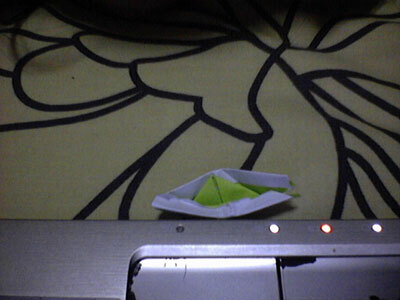 From reader in London " Origami Boat! I think it is pretty small :) "
From Mia in Norman " My Origami Boat is amout 4mm I took the pic on my computer becsuse everything else I could use was blurry, I broke the record! " From Dasa in Bratislava " Traditional origami boat . They are made from 1 sheet of red copy paper (A4). 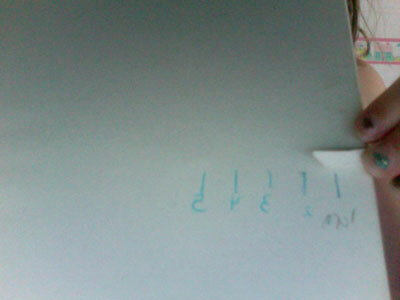 I am able to make ten boats, in the upper corner you can see the last piece of paper. 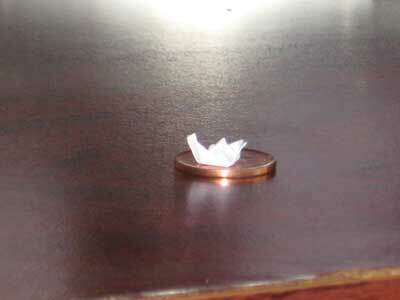 The smallest boat has 5 mm length. " 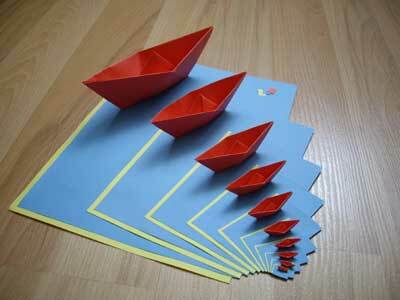 Love the progression from large to small origami boats! 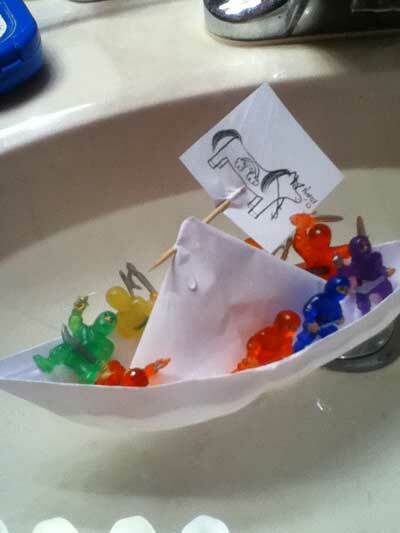 From Emilie in Independence " I made the boat, lut a flag on it, and put my ninjas on it to go on a mission. Bt then it sunk faster than the Titanic : ( "
From Owen in Muscle Shoals " I made my origami boat out of a math paper from school. " 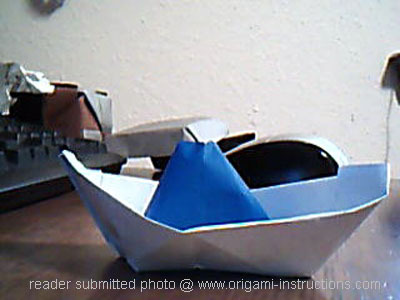 From Gabi in Massachusetts " A photo of my origami box with an origami boat in it! The box held very well even when wet! I would have moved it to take a better picture, but I had to take it as quick as possible before the whole thing got wet. " From Haney in Singapore "Doing a small boat was hard. my boat is 1cm long. " 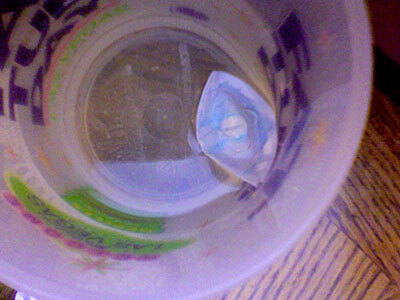 From Alyssa in Aurora " My brother didn't believe the floating origami boat would really float and it did! (p.s. 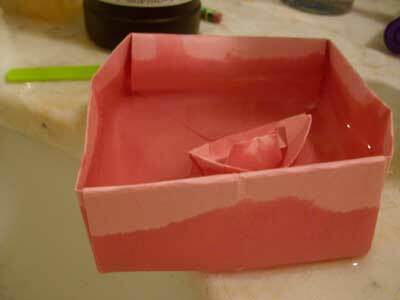 it's the size of a penny) "
From Sophie in Healdsburg " i made this boat for mothers day. i am going to let it go into the sea so my mother can find it. she died 6 years ago. " 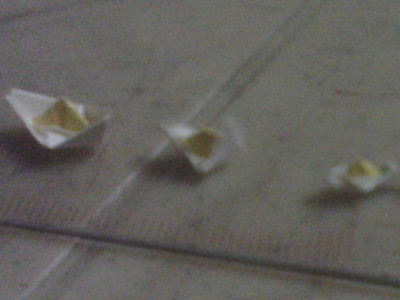 From Kathleen in Erie " My roommate and I made origami boats to race down the flooded sidewalk by our apartment. " 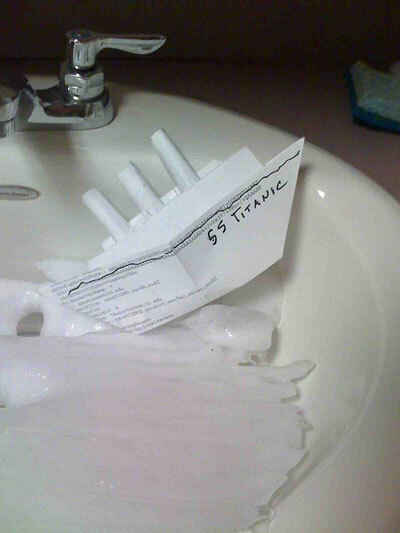 From Karla in Northampton " This is an origami boat I made, inspired by the ice in the sink from our defrosting refrigerator - the SS Titanic, of course. I added some details to make it look more like an ocean liner. " 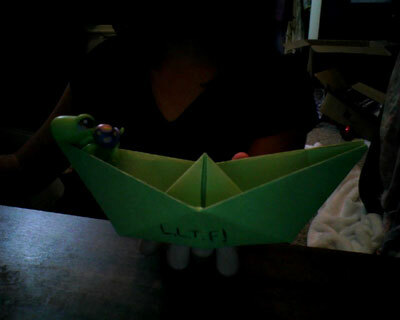 From Lillian in Andover " the boat is only 2 centemeters long. It's the third one I ever made! It might not beat the record, but it's tiny all the same! " 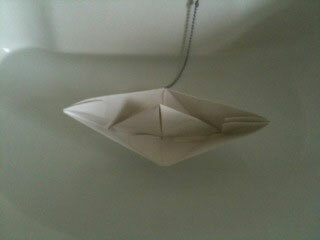 From Crux in Oxford " These origami boats turned out, in my opinion, beautifully simple and elegantly charming. Arigatou~. " 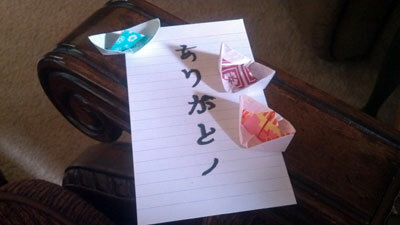 Love your origmai boats and Japanese calligraphy! From reader in Omaha " S.S. Faith, I just wanted to design it! Turned out pretty cool! 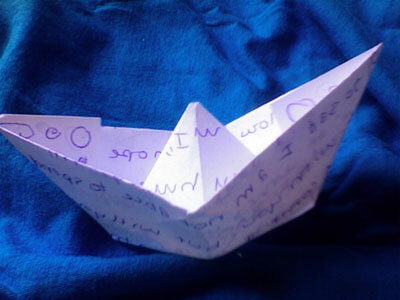 : ) "
From Nicole in Welling " This is my 1st try at an origami boat. Thank you for helping me prove to my brother that they can float! " From Alan in Cleveland " I love this site, and I finally decided to post my art. 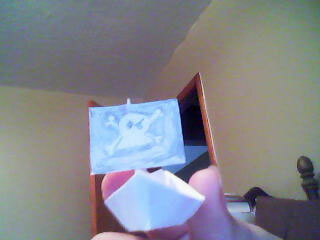 This is my awesome miniature pirate boat. You can't see the pirates, because they are ghosts. And ghosts don't show up in pictures. " From reader in Clearfield " l.l.t.f. is little longer than foot! my lps turtle likes it! "